After six years NVscene is back again and Hugi got an exclusive report also this time around. All photos by Jason Scott except the Hornet reunion photo - this one by Phoenix. 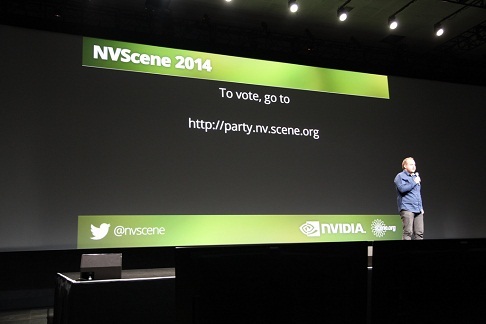 NVScene is a one-of-a-kind event, as far as demoparties go. For starters, the second edition was held six years after the first. 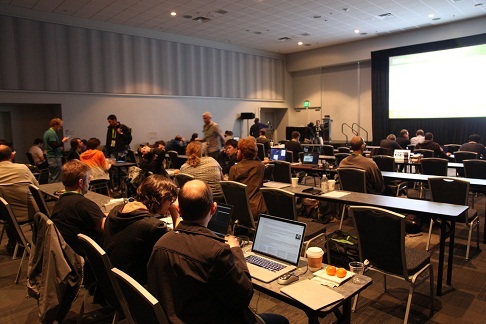 In 2008, NVidia, maker of the Graphics Processing Units found in millions of gaming PCs and graphics workstations, held its first industry conference in San Jose, California, USA, called NVision. It had the usual exhibits and seminars, but they also wanted to attract enthusiasts with a more festive atmosphere. So they added a massive LAN party, but were also looking for people more.. creative with their technology. 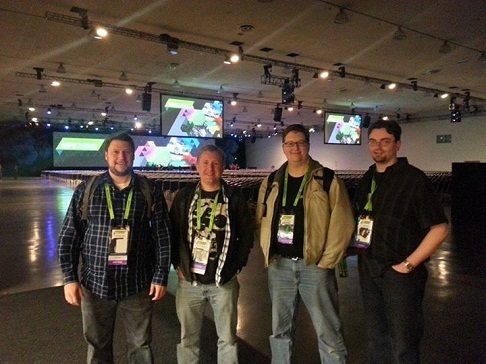 Three stalwart demosceners, Gargaj, Gloom, and Steeler, traveled to the United States to visit NVidia and Pixar, and to build a bridge between the computer graphics industry and the demoscene. 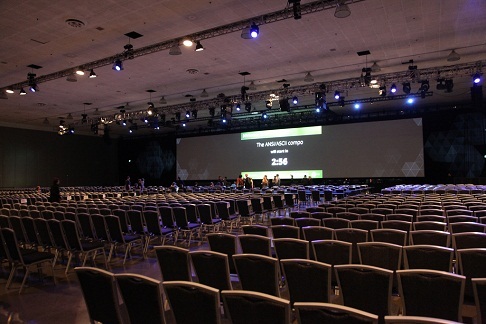 NVidia liked what they saw, and allocated a room of the San Jose Convention Center to an event called NVScene. They even donated complete PC systems (including NVidia GPUs of course) to demogroups interested in competing. This grabbed a lot of attention at the European parties in 2008, and soon NVScene had both a formidable lineup of speakers and competition entries, in the demo and 4k intro categories (Stargazer by Andromeda/Orb and Texas/Keyboarders were the respective winners). Then there was the stunt pulled by Blockparty organizer and computer historian Jason Scott, with help from ACiD founder RadMan, wherein a rented recreational vehicle pulled up across the street from NVision, and offered a keg of beer inside, called, what else, RVScene! To have a collection of some of the best scene talent in Europe packed into a van in San Jose was a surreal experience. NVision would not return the following year, or ever again. along with the fountain in front spraying green colored water just for NVidia, but the exhibits and seminars remained and were successful. This encouraged Gargaj and Gloom to bring back NVScene for 2014. This time, potential entrants were not lured with free hardware. But another impressive lineup of speakers, along with the party taking place a month before Europe's biggest demoparty, Revision, raised interest. Two invitation intros were released. The first was "nvite" by Kewlers, an Android demo released at the Ultimate Meeting in December 2013. 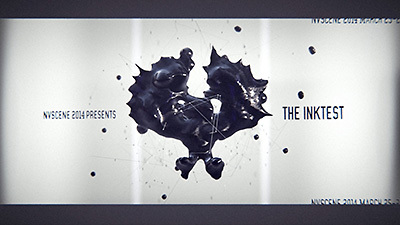 The second was "The Ink Test" by CNCD and Fairlight, a Windows demo released only a week before the party began. Both were, interestingly, colorless. March 22nd began my journey to California. I arrived ahead of NVScene to attend the #trax 20-year reunion party. #trax was an IRC channel formed in 1994 for trackers, those music programs that created MOD, S3M, XM, and IT files so popular in the PC and Amiga scene in the 1990s. Back then, I was still Phoenix, but a tracker musician in KLF, aka, KFMF, aka Kosmic. Around 20 guys showed up. Many had moved to the San Francisco area for work, while others like myself travelled hundreds or even thousands of miles. One of those travellers, IC (InspiredChaos), was the only other guy at the #trax reunion who attended NVScene for all three days. Basehead, who planned both the 10-year and 20-year #trax reunions, also stopped by for a day. What kept the others away from NVScene was the $100 minimum entrance fee (to NVScene plus keynotes), as there was no one-day visitor pass available. As you can read later on, it was worth it. :) On Sunday, a dozen or so of us met again in Oakland at Zachary's Pizza, famous for their Chicago-style deep-dish. It was an hour wait, but we passed the time chatting outside. I spent the rest of Sunday with Louis Gorenfeld (aka Farmer on #trax), touring around the northwest corner of San Francisco, and playing with Protracker on an old Amiga 2000. I arrived at the convention center late Tuesday morning, shortly after Jen-Hsun Huang, CEO of NVidia, gave the opening keynote presentation. The company had already announced its GeForce 800 series of mobile GPUs, so the only new product introduction was the dual-GPU GeForce GTX Titan Z behemoth, a $3000 (!) graphics and physics computation card, which wasn't available for at least another two months. Jen-Hsun and crew otherwise discussed mostly professional-grade technology such as Quadro/GRID and Tegra. I was surprised to find no signs pointing to NVScene, as I spent a quarter-hour searching up and down various halls. Finally, I found the room tucked in a corner in the far back, to the right of the keynote room. There were seats and tables for around 150 people, with, of course, a nice screen in the front. I met Gloom and Gargaj, who along with Smash and a couple others were hanging out at the organizer table in the back of the room. Coincidentally, Trixter arrived at the same time as me so I met up with him while scanning the halls. We also met up with IC (Blerx) who was flying a tiny little RC drone around the room. 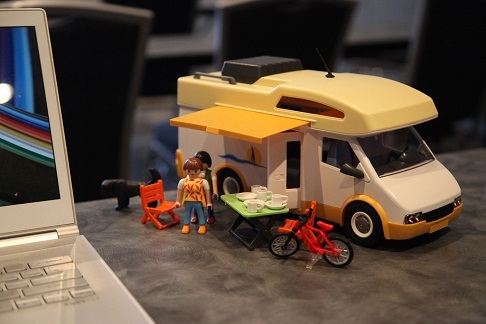 Jason Scott showed up, and placed a Playmobil toy recreational vehicle by his laptop. That would be the only reference to RVScene this year. Food was.. free! Lunch and dinner were catered in the exhibition hall, and were excellent, far beyond the 2008 offerings. But like the last NVScene, everyone also got several drink tickets. I got breakfast at the hotel I stayed at, which required a bus ride but was cheaper than anything nearby and cleaner/bigger than expected. There was also a candy station which provided limitless sugar, dangerously. :) One of the exhibitors was Oculus VR, known for their "Rift" device. While they were at the conference, it was announced they were bought by Facebook for a cool $2 billion! physics applied to coding techniques. The first talk, "Realtime Fluid Dynamics" by Maq/Floppy, fell into the latter category. On the other hand, the second talk, "Demo effects on the classic Amiga" by Blueberry/Loonies, shed a light on how many pre-1994 Amiga 500 (OCS/ECS graphics) demo effects were done. Even the blitter and copper chips of the Amiga could be considered the original hardware graphics accelerators. :) This was followed by a talk on the use of virtual and augmented reality in games and graphics development by Visy/Trilobit (including a humorous look back at an old PWP demo on the subject), and realtime raytracing techniques by the master himself, Smash/Fairlight. Day two had the most seminars. It started with Mr. Khan, one of the organizers of the NAID parties in Quebec back in the mid-90s. It was on procedural content generation and shaders, but honestly did not seem to have much detail, and the introduction ran too long. I did feel bad that he was on at the same time as the second keynote speech from Pixar. Next was Pixtur/Still, who returned after the last NVScene with another talk on demo design. He has a unique, thorough perspective on design, and introduced the concept of "paintovers" (search for the thread on pouet.net) to get feedback and ideas on color and tone before releasing a production. He was followed by Gloom himself, who talked about multi-platform graphics tools, using Realtime Studio from Outracks (the company spun off from the demo group). They've done a good job of translating their demoscene know-how into a commercial product. Up next were Polaris and Barzoule/Northern Dragons, who discussed theory behind creating 4kb intros. They seized the opportunity to show off "W4k3d", which utilized red-blue 3D glasses which they handed out like at @party 2012 where it debuted. They revealed some funny tricks like using Wingdings font outlines to create 3D models. Honestly, I missed the next presentation, "Interactive Simulations (where nobody has to die)" by Flight404/Cinder, so I cannot describe that one. I returned for the last presentation of the day, given by iq/RGBA, famous for the "Elevated" 4k intro and many 4k procedural graphics. He showed Shadertoy, a brilliant website which allows people to write and change shader code, and watch the results in real-time. This site has gotten attention outside the demoscene from budding graphics coders. 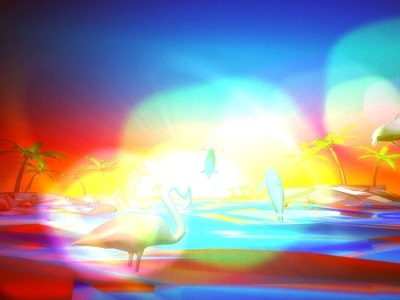 IQ showed off beautiful animations of both lifelike and surreal landscapes using pure mathematics. He works for Pixar, not far from NVScene, thanks in part to NVScene 2008! 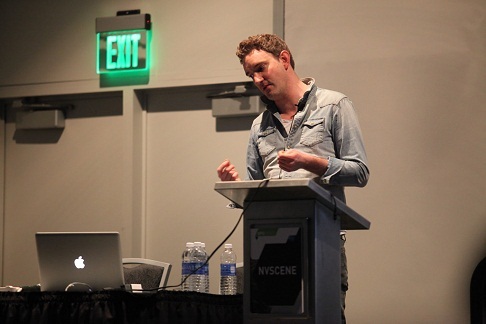 On Tuesday night, the first two NVScene compos took place in the same room where the keynote speeches were given. This was undoubtedly the largest compo-viewing room in demoscene history! Thousands of seats were available, but only a hundred or so were filled. The screen was much larger than the already sufficient screen in the NVScene room, and the sound system let you feel those bass drops through your chair. Of course, it was unnecessary for the ASCII/ANSI competition, which Radman somehow convinced NVidia was relevant to their conference. :) There were some nice entries from Blocktronics and ACiD, among others. After that was the Android demo compo, which featured demos running on the NVidia SHIELD. "Cat.log", by Trilobit, was a mellow, artistic conceptual demo. "Feed Me Lies", by Fairlight, takes Smash's single-scene, black and white design to the small screen, with doors full of cubes and music from Lugoober. A couple of my former group and project mates visited on Wednesday: Christopher Mann (aka Snowman, in Hornet from '94-'98 and editor of the old DemoNews textmag), and Jeremy Williams (creator of the featurettes in MindCandy volumes 1 and 2). Jeremy brought a GameFrame, his Kickstarter project which is a programmable 16x16 full-color square LED grid in a wooden frame about one square foot in size. I also spotted AND, the Russian ex-scener who made the 604 demo and Zoom 3 intros (he now lives in the US). Other attendees I haven't mentioned yet included Andr00/Brainstorm, Luis/Desire, Starpause (aka k9d)/ND, and Metoikos/@party. On Wednesday evening, we returned to the massive keynote room for the final two compos: 4k procedural graphics, and PC demo. While 4k graphics rose in popularity a few years ago, it's remained stagnant for the past year or two. It was great for the genre to get exposure at NVScene, but I was still disappointed there was no 4k intro compo instead (or in addition), like in 2008. There were three entries. "There" by Provod was a nice landscape which was a little too saturated to seem realistic. "Lego Tutorial" by Archee was a rendering test of sorts with motion block on some falling bricks, glass lenses, and balls with various degrees of reflection/refraction. The technique was spot on, but the composition was uninspiring. "Leggy" by Psycho & Maytz/Loonies featured a dark, cave-like scene with a weird spider-like creature, glossy and dripping ice or some kind of goo. It won the competition. Following the compos, the GTC held an afterparty at a hotel down the road. It was a crowded affair, giving computer geeks the opportunity to mingle and be socialites for one night. :) I forgot the pass needed to enter, but got in anyway. There was a fancy lineup of hors deurves and chef's creations, some mediocre DJs, bartenders, and even a laser tag room of sorts. I wasn't blown away, and wasn't looking to connect with industry people anyway, but it was a fun diversion from the convention center. On the other hand, there was an NVScene afterparty on Friday, held in the city of San Francisco. It was organized by CODAME, an art/tech non-profit, and GeekdomSF. I flew back home on Thursday, so I'm sad to say I missed this and can't report on it, but I've heard very good things, and they had a good mix of oldschool and modern demo shows and DJs, so look around for photos or video clips. 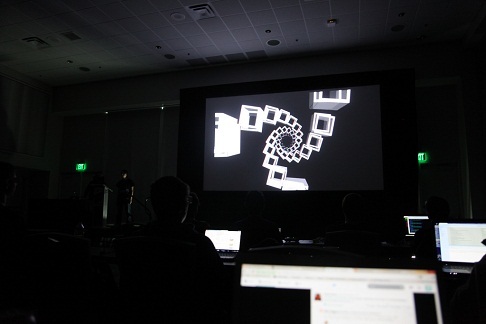 So, NVScene 2014 was a success, thanks of course to the open minds of NVidia and GTC, and two demoscene and party organizing veterans, Gloom and Gargaj. It was certainly worth my coast-to-coast trip, at least with all the other events happening. 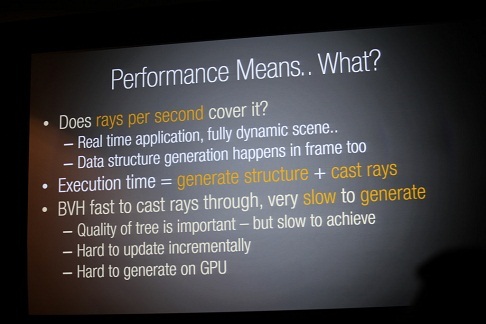 :) The 2015 GPU Tech Conference has already been announced, so who knows, maybe NVScene will return as well?